The Future of Furniture - Part 4 - What Can a Newbie Build? 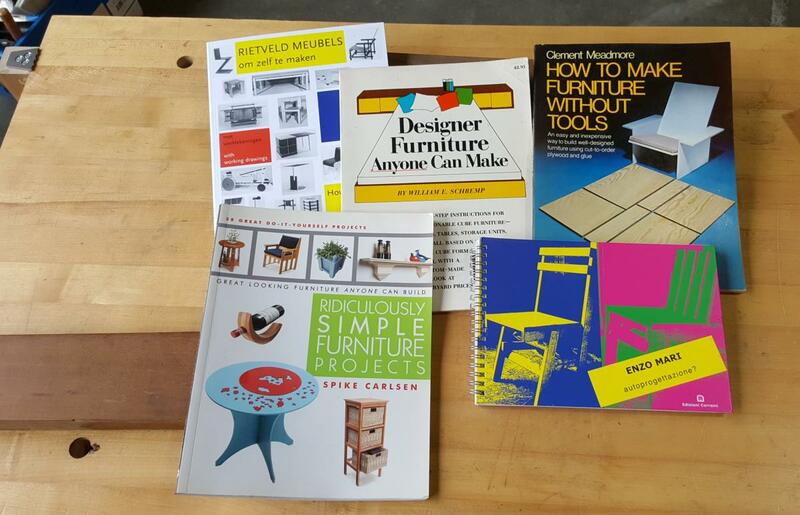 My favorite of the bunch is "How to Construct Rietveld Furniture&comma;" which we stock. (The first edition came out in 1986; this is the later second edition.) It's still in print and still great. Gerrit Rietveld, like Gustav Stickley and other Arts & Crafts proponents, wanted to design furniture that anyone could make. Unlike Stickley, Rietveld used construction grade lumber, dowels, screws, nails and paint. Nearly a century later his pieces still look fresh and modern. We offer classes in building a version of the Zig Zag chair. Seventy years after it was first introduced the chair looks as modern as ever and isn't a very complicated build. All the designs in his book are like that. The original zig zag chair was made out of solid wood, in the class we use Europly, which is simpler to use. We also use modern equipment for cutting and joinery. Unfortunately most beginners don't have access to that sort of equipment in their home. The original chair was bolted together, and like most of Rietveld designs basically require some sort of handsaw, some sort of drill, and simple fasteners. Nice article and book list, thank you. I am myself in the situation those books address: newbie and living in a flat without much room or tools to woodwork. Add to that a baby and a toddler and any project I tackle has indeed to be ridiculously simple for me to even consider. The three pieces I made (A pair of nightstands and a changing table) were based on a cut-list I figured and gave to our local (Swiss) equivalent of Home Depot. The cut were precise enough for my needs and I did not have to adjust anything. Just drill and screw. You can even design your pieces around the lack of precision of the outsourced cuts. For example by avoiding flush joined surfaces that rely on the precision of the cut. That's the kind of tip and plans I would indeed look for in such a book. I am 50. No woodshop in my school growing up. However, as a kid I spent a lot of time building models (Revelle). They weren't anything special. Just the kind where you found the piece numbers and glued them together in the order they told you. As I got older, I would start painting them. I think the last one I built was my freshman year of college. I see woodworking as a progressing of that. Now I start with lumber, cut to dimensons needed and fit and glue. Obviously I'm over simplifying as there are skills one needs to learn to make things. Having said that, I didn't get too wrapped up about it. I listed and watched Paul Sellers mostly to pick out the tools and learn the skills I needed to start. Much like my model building, the first projects are more crude. However, over the last 3 years things become more and more refined. I certainly enjoy doing it. When I started law school I had no furniture for my studio apartment, but I did have a Millers Falls Dyno Mite, which was an electric drill that powered a circular saw, jig saw, drill press, grinder, and maybe something else, and a book called "Nomadic Furniture. 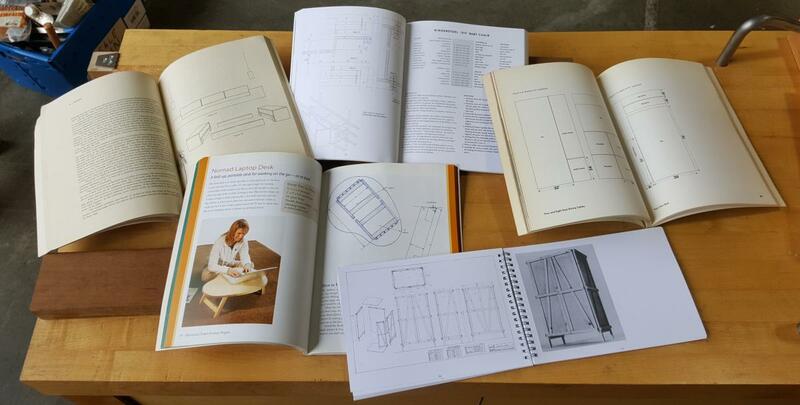 This book featured plywood furniture that could easily be knocked down and transported. In the couple of weeks before school started I built a bed, dining table and desk, which served me well through three years, and through several years while getting established, and now, forty three years later. the desk is next to my computer station, carrying the printer, scanner, uninterruptible power supply ane wifi router. It's no longer nomadic as I am no longer nomadic. I will second Mr. Brodsky's recommendation of Nomadic Furniture (by Papanek and Hennessy). Some of the designs are crude, others more sophisticated, but all of them assume a limited toolkit, mostly of basic electric hand tools. Both authors were (I believe) architects, or maybe one was an engineer? There's a section of corrugated paper furniture featuring a design or two by this young guy just starting out, Frank Gehry . . . worth a look. The only reason I did not include "Nomadic Furniture" (I have a copy) was that for some reason I thought it was published in the 80's - my mistake - it is from 1973 and very much deserves to be included in the list of pioneers.